Local anesthesia is of key importance in today's dental practice. Mastering anesthesia application techniques intraorally is difficult and requires meticulous training, yet acquiring the skill is an integral part of the dentistry undergraduate curriculum. A well-trained student will have more confidence and will need less supervision throughout the course. The inferior alveolar nerve block (IANB) is the most common type of intraoral anesthetic techniques used for dental procedures of the lower jaw. Herein, I present a lesson plan for a 4-h session based on Gagne's events of instruction along with the incorporation of Peyton's four-step approach. In general, Gagne's nine events of instruction identified the mental conditions of learning that are necessary for effective learning when adult students are presented with various stimuli. 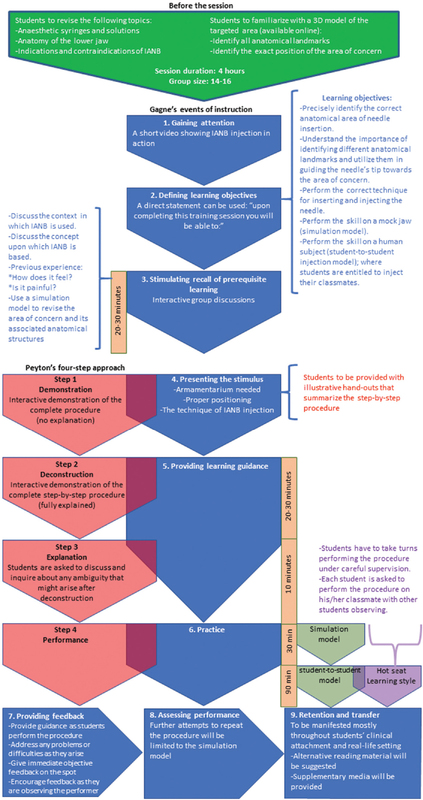 This model is based on the nine instructional events used during a teaching session. These are gaining attention, defining learning objectives, stimulating recall of prerequisite learning, presenting the stimulus material, providing learning guidance, practice, providing feedback, assessing the performance, and enhancing retention and transfer. Peyton's four-step approach is a model for teaching practical skills. These are demonstration, deconstruction, explanation, and performance. As a dental faculty staff member working in the conservative dentistry department, I provide preclinical and clinical teaching for dental students. This paper presents a lesson plan to teach INAB injection for dental students. Before designing this plan, students' views and concerns will be obtained, to incorporate their needs into the lesson design process. As a prerequisite to the session, students will be advised to prepare for it by reviewing several important topics. A computerized three-dimensional model of the target area will also be provided to more fully familiarize students with the area of concern. The targeted area cannot be seen directly; therefore, students will follow specific anatomical landmarks in order to guide the needle's tip to its desired destination. As a result of this and the fact that major procedural errors might cause serious health issues, a thorough knowledge of the anatomical structures is strongly recommended as a prerequisite for a successful training session. The aforementioned prerequisites combined serve as merely a starting point from which students will be able to understand how to perform the procedure with confidence. Strategies adopted in this lesson plan for each of Gagne's events are customized to achieve the learning style required to successfully deliver this session [Figure 1]. A short video showing IANB injection being performed in real time will be projected. This method will be targeting visual, auditory, and kinesthetic learning domains simultaneously. The use of multimedia can maximize the learner's attention and interest, as learning is motivated by triggering the learner's curiosity. It is of utmost importance to refrain from simply listing the proposed learning objectives, for there has to be a dynamic atmosphere where student's participation and collaboration is highly encouraged. These learning objectives are to be discussed with the students to verify that they understand each and every objective. This will aid in achieving a more meaningful learning experience. From the students' perspective, for this skill in particular, they know they are not doing this entirely for examination purposes; instead, their main objective would be to master the technique and to overcome the stress associated with it, which is in complete harmony with the proposed objectives stated earlier. Students at this point are encouraged to point out their preinstruction concerns, and areas of ambiguity that they believe would need special attention. Hereafter, the objectives are to be modified accordingly to address the points raised by students if any. This approach will almost certainly trigger the urge to know, utilizing the “internal drive ”to learn which will reinforce the learning process markedly. Afterward, a simulation model of the jaw is used to revise the anatomy of the appropriate anatomical area, with each student asked to identify and palpate the anatomical landmarks of concern. This, in turn, will provide enough motivation to learners to reinforce their preexisting knowledge base. The buildup of knowledge via this systematic approach follows the path of constructivism and fulfills the multiple intelligences theory for it comprises of several memory aids such as visual, kinetic, and intra- and interindividual intelligences. This is the event where the new material content, which leads to acquiring the skill, is introduced to students. Material content and new skill must be presented meaningfully and demonstrated in the most explicit way possible. In this learning session, all aspects of the procedure should be explained: armamentarium needed, proper positioning of the operator and the patient, and the technique of IANB injection. At this point of time, Peyton's approach will also be incorporated to teach the actual procedural skills where an interactive demonstration of the whole procedure will be held on a simulation model resembling the jaw and the associated anatomical structures at normal speed without any explanation (Peyton's step 1). Students will be provided with illustrative handouts that summarize the step-by-step procedure. These actions, in turn, will stimulate visual, kinetic, and intra and interindividual intelligences; in addition, the handouts are especially valued by visual learners. This event is where the second and third steps in Peyton's approach, deconstruction and explanation, are incorporated. Here, the inferior alveolar block injection procedure is repeated on a simulation model with the step-by-step procedure being fully explained, describing each and every step as they happen and illustrating practical tips and hints (Peyton's step 2). Learners are encouraged to discuss and inquire about any ambiguity that might arise during this stage. This activity will provide a role model against which students can self-evaluate, an activity that particularly appeals to reflectors. Hereafter, students are asked to do a comprehensive role where they verbally explain every step of the procedure, which will allow for an initial assessment of their understanding before the actual skill performance occurs (Peyton's step 3). Explanations should be provided in an interactive environment, and the depth of the explanation should reflect the information that is obtained during the demonstration. In this event, students are required to practice the procedure to confirm their understanding through performing. Repetition further enhances skill retention and promotes safety and efficacy. Therefore, a rather longer period of time will be allocated for this event. This event also demonstrates the fourth step in Peyton's approach (i.e., performance). Students will be requested to perform the skill on a simulation model with indirect supervision. Following this, a student-to-student injection model will be adopted. Groups of two will be allocated where a “hot seat” teaching style will also be incorporated. In the “hot seat ”teaching style, students have to take turns performing the procedure under a careful supervision. As a result, each student is asked to perform the procedure on his/her classmate with other students observing. Such an approach provides a nonthreatening training atmosphere although some students might feel intimidated and frightened at first. Clearly stating that a student-to-student injection model will be utilized will not only give students the “adrenaline rush” but also provide enough motivation for them to concentrate throughout the training session. Yet, for their comfort, this step will be preceded by performing the skill on a simulation model to fine-tune the process of directing, inserting, and injecting the needle. The utilization of the simulation model in conjunction with the student-to-student model resulted in more confidence when performing the procedure, with improvement in needle positioning, hand dexterity, and handling of the syringe in the clinical setting. This was also evidenced by the reduction of hesitation and fear when performing the procedure. Increased self-confidence has also been reported elsewhere when a simulation model was used to teach dental students inferior alveolar block injections. Moreover, a decreased rate of postinjection complications (e.g., pain) was achieved when injecting a simulation model before injecting a classmate. The combination of both direct supervision and indirect supervision in small group training facilitates the ability to overcome all the aspects of difficulty flexibly and to more fully understand the new skill. These activities will suit activist learners especially. As a continuation to the previous event, the tutor's role is to provide guidance to students as they perform the procedure, to address any problems or difficulties as they arise, and to give immediate objective feedback on the spot. In addition, other students are encouraged to provide feedback as they are observing the performer which, in turn, will encourage students and enhance social learning. It may also be stated that such an activity will suit reflectors who thrive on monitoring others. Ideally, more than a one single performance is needed to ensure that the new skill has been reliably acquired. However, time and resources are too limited for this activity to be achieved. In other words, an individual cannot be subjected to more than one injection per session. As a result of this and the fact that each student has only his/her partner to practice upon, any further attempts to repeat the procedure aiming to fine-tune the skill will be limited to the simulation model. It is possible to assess the desired outcome by looking for signs of numbness in the targeted area. Still, students who are keen to practice the skill and add more confidence to their performance can practice on their “actual” patients, whom they are going to treat in the future, while being initially supervised and assisted until they become able to perform the skill on their own. This activity will be especially appealing to analytical theorists who consider themselves to be perfectionists. Students are expected to continue to perform IANB injections throughout their clinical attachment, and therefore, they will continue to follow instructions, tips, and hints learned in this session. This will give them the opportunity to retain the clinical skill they have obtained and to transfer the knowledge they have learned in a clinical real-life setting. This lesson plan has been found to be helpful after having implemented it several times. Students have given positive feedback and have reported feeling less anxious and more confident after attending this teaching session. In terms of lesson planning, Gagne's theory of instruction offers invaluable aid to tutors as it is considered as a backbone on which a skeleton of several learning styles and activities can be constructed. The events are clearly illustrated, which allows for the establishment of a systematic methodology to design a comprehensive lesson plan. Simply speaking, different students possess different learning styles, and on that account, the resultant blend of styles and activities will yield a better learning outcome. Gagne RM, Briggs LJ. Principles of instructional design, Holt, Rinehart & Winston, New York; Holt, Rinehart, Winston; 1974. Peyton JR. Teaching in Theatre. Teaching and learning in medical practice, Rickmansworth; Manticore; 1998. p. 171-80. Gagne RM. The Conditions of Learning. New York: Holt, Rinehart, Winston Inc.; 1965. Pogrel MA, Thamby S. Permanent nerve involvement resulting from inferior alveolar nerve blocks. J Am Dent Assoc 2000;131:901-7. Kharb P, Samanta PP, Jindal M, Singh V. The learning styles and the preferred teaching-learning strategies of first year medical students. J Clin Diagn Res 2013;7:1089-92. Buscombe C. Using gagne's theory to teach procedural skills. Clin Teach 2013;10:302-7. Lee JS, Bassiur JP, Graham R. Effectiveness of simulation models in local anesthesia training. J Oral Maxillofac Surg 2014;72:e35. Kaufman DM, Mann KV. Teaching and learning in medical education: How theory can inform practice. Understanding Medical Education: Evidence, Theory and Practice. Hoboken (NJ): WileyBlackwell; 2010. p. 7-29. Merrill MD. Constructivism and instructional design. Educ Technol 1991;31:45-53. Khadjooi K, Rostami K, Ishaq S. How to use Gagne's model of instructional design in teaching psychomotor skills. Gastroenterol Hepatol Bed Bench 2011;4:116-9. Gardner H. Intelligence Reframed: Multiple Intelligences for the 21st century, Basic Books, Hachette UK; 2000. Dix G, Hughes S. Teaching students in the classroom and clinical skills environment. Nurs Stand 2005;19:41-7. Lee JS, Graham R, Bassiur JP, Lichtenthal RM. Evaluation of a local anesthesia simulation model with dental students as novice clinicians. J Dent Educ 2015;79:1411-7. Honey P, Mumford A. The Manual of Learning Styles. Maidenhead: Peter Honey; 1992. Chowdhury RR, Kalu G. Learning to give feedback in medical education. Obstet Gynaecol 2004;6:243-7.